This interesting surname is of Irish origin, but the source is uncertain. The Gaelic form is "O' Faodhagain", but a personal name Faodghagan is not known, and it may be a Gaelicized version of a surname of Norman origin. A number of Irish bearers of this name are descended from Patrick Fagan, who owned estates in County Meath in the 13th Century. 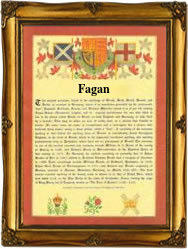 According to tradition, his name was originally O' Hagan and he assumed the name Fagan at the command of King John, for reasons which are unclear. For many Centuries the surname has been associated with Counties Dublin and Meath; a branch of the family was also found in Kerry and another in Cork city, where Christopher Fagan took refuge in 1497. He had been a supporter of Perkin Warbeck's claim to the throne, and Cork was solidly behind that pretender. Among the recordings in Ireland are the christenings of James Fagan on December 17th 1670 at St. Peter and St. Kevin, Dublin and of John, son of John and Sarah Fagan on December 16th 1684 at St. Michan, Dublin. The first recorded spelling of the family name is shown to be that of William Fagan, which was dated 1200, Dublin City, Ireland, during the reign of King John, known as "Lackland", 1199 - 1216. Surnames became necessary when governments introduced personal taxation. In England this was known as Poll Tax. Throughout the centuries, surnames in every country have continued to "develop" often leading to astonishing variants of the original spelling.